RTSEG: REAL-TIME SEMANTIC SEGMENTATION COMPARATIVE STUDY for comparing different realtime semantic segmentation architectures. SHUFFLESEG: REAL-TIME SEMANTIC SEGMENTATION NETWORK which introduces a new fast realtime semantic segmentation network based on the ShuffleNet unit. Semantic segmentation benefits robotics related applications especially autonomous driving. Most of the research on semantic segmentation is only on increasing the accuracy of segmentation models with little attention to computationally efficient solutions. The few work conducted in this direction does not provide principled methods to evaluate the different design choices for segmentation. 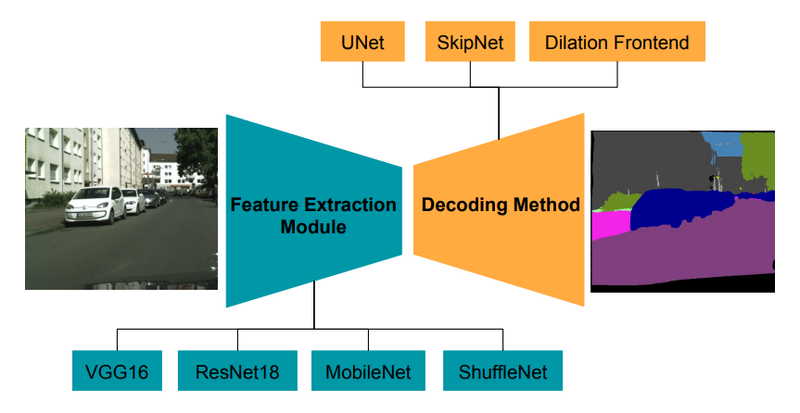 In RTSeg, we address this gap by presenting a real-time semantic segmentation benchmarking framework with a decoupled design for feature extraction and decoding methods. The code and the experimental results are presented on the CityScapes dataset for urban scenes. NOTE: The rest of the pretrained weights for all the implemented models will be released soon. Stay in touch for the updates. The file named run.sh provide a good example for running different architectures. Have a look at this file. Remove comment from run.sh for running fcn8s_mobilenet on the validation set of cityscapes to get its mIoU. Our framework evaluation will produce results lower than the cityscapes evaluation script by small difference, for the final evaluation we use the cityscapes evaluation script. UNet ResNet18 should have 56% on validation set, but with cityscapes script we got 57.9%. The results on the test set for SkipNet-MobileNet and SkipNet-ShuffleNet are publicly available on the Cityscapes Benchmark. To measure running time, run in inference mode. To run on different dataset or model, take one of the configuration files such as: config/experiments_config/unet_resnet18_test.yaml and modify it or create another .yaml configuration file depending on your needs. NOTE: The current code does not contain the optimized code for measuring inference time, the final code will be released soon.